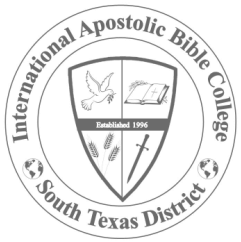 The History of the International Apostolic Bible College begins in 1966 with the efforts of Bishop Eleazar Rodriguez, former pastor of the Apostolic church in Hayward, CA. In 1977 Bishop Rodriguez was transferred to Denver, Co. where he was named pastor and bishop of the Colorado District. In 1977 the directorship of the bible college was passed on to Daniel Jauhall. The post-1977 shift led to the creation of the first extension of the bible college by Pastor Willie Mendoza who opened the extension in Houston, TX. Nevertheless, great leaders such as Dr. Baldemar Rodriguez and Dr. Marco A. Zacarias had to go and study at the bible college in California. Seeing the need for local bible colleges, in 1996 Dr. Zacarias opened an extension of the bible college here in South Texas. Following the opening of the bible college in South Texas, Dr. Zacarias went on to open extensions in every Apostolic district in the United States and became an international missionary with the Department of Christian Education. In 2013 under the directorship of Pastor Rufino Cedillo, the South Texas CBAI opened its own extensions in Laredo, Alice, San Juan and Harlingen, TX. In 2014 there was a consolidation of the San Juan and Harlingen sites in Donna. Currently, CBAI South Texas counts with teaching sites in Alice, Donna and Laredo, respectively.